Beer drinkers, rejoice! There’s a place on Earth where your favourite beverage is cheaper than water. This is not a drill. Welcome to Prague, the beautiful capital of the Czech Republic, the birthplace of Pilsner, and the best place in the entire world for lovers of a good drop of amber nectar. Here, the citizens are fuelled by what they call ‘Czech water,’ and although they do consume more beer per capita than anyone else in the world, it’s not because they’re drunks. The Czechs have been brewing beer for over a thousand years, which means they’ve developed a great thing, stuck to it, and become extremely proud of it. But the love affair goes well beyond just drinking; over the years a huge beer culture has grown, becoming part of the DNA of their national identity, and they’re as loyal to their beloved ‘liquid bread’ as the English are to football. To understand the Prague and its people, you really have to get under the skin of their beer culture. Here are the best four places to do it. 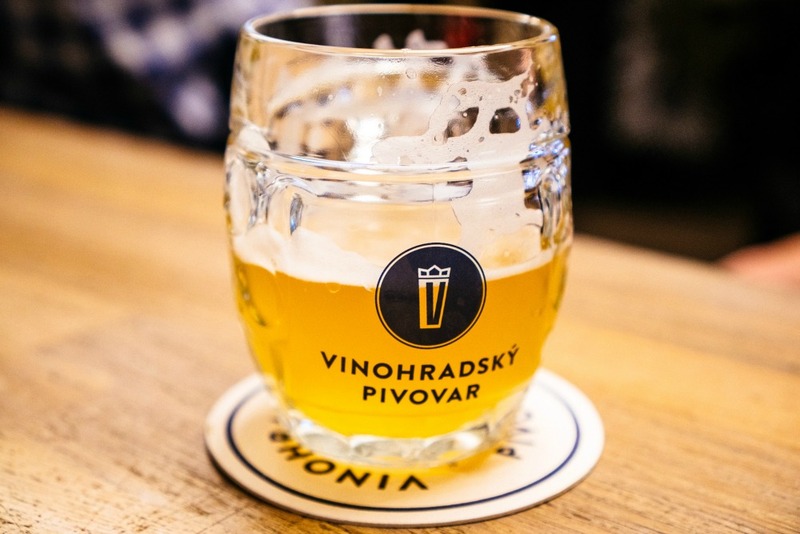 When you open the door to the white-washed vault of the Vinohradský Pivovar microbrewery, the buzz of Czech chatter that greets you is a pretty good indication you’re in the right spot for getting into the local beer culture. Built in 1893, it holds a sombre history — seized during WWII as a storage facility for belongings of Jewish people, falling into ruin during the communist era, and burning down in a mysterious fire in 2000. Today the two long rooms are full of happy noise, tables fill again as quickly as they clear, and you’ll always find their popular (and delectable) 11° light lager and 13° amber on tap. Unlike in the rest of the world, expect your mugs to come out with foam an inch thick here — it’s actually a sign of good carbonation, a good pour, and a dang fine beer. Tastebuds will be blown. Is your glass half empty or half full? Either way, time for another! With passionate beer culture usually comes passionate beer food culture, and the Czechs have the two down to a fine art. It’s decidedly uncool to drink ’til you get drunk here, so it’s rare to see a nectary mug thrown down without some kind of hearty accompanying snack. Whole sections of menus are even devoted to the gastronomic jigsaw puzzle of beer and food matching — we highly recommend the pork brisket with the 11°! If you’re feeling brave (or need to shake off an annoying travel buddy), order yourself some olomoucké tvarůžky. There’s a pretty good chance that this really stinky cheese was first invented to keep enemies at bay (jokes, but seriously), but it was actually discovered to be a pretty brilliant snack with beer too. Welcome to one of Prague’s best-loved beer establishments, where you’ll always find beers from two of the most favoured and innovative Czech breweries, Kocour and Matuška, on tap! Kulový Blesk is one of only 10 pubs (of around 5,000) in the Czech Republic that are included in the Pivni Alliance — which means they really, really know how to do their job. Because these guys are on top of their beer game, this is a good place to test out the super efficient Czech method of ordering another beer: simply remove your glass from its ‘beer mat,’ and wait as a fresh pour is brought over to you. But be warned, leaving a beer unfinished is one of the worst insults you can give a bartender here, so place your coaster over the top of your glass if you’re in need of some time out! Kulový Blesk also serves up another local favourite, Utopenec. Rumour has it the Czechs brought this (very) vinegary pickled sausage to the table at the 1891 Jubilee celebrations, and it never left. Add some homemade potato chips and dips and you’re on your way to much merriment! Tucked away down a quiet Prague street, Café Kolibka is a little way off the regular pub crawl trail, even for locals. But don’t let its lack of guidebook fame deter you. This cosy, rustic pub is one of a trusted few serving beer fresh from a small village brewery that only sells to distributors within a 30-kilometre radius. The proof’s in the beer tap people — you’re in very safe hands! Don’t leave here without sampling a local beer food staple: marinated cheese (nakladaný hermelin). In case you need convincing (really?! ), we’re talking about Camembert cheese marinated with garlic, onion, bay leaves, and black pepper. You’re welcome. If you’re a keen beer drinker, you already know that the best invention to come out of the Czech Republic is the Pilsner Urquell — and you have a Czech tailor by the name of Jakub Pinkas to thank for its popularity. In 1843, Pinkas discovered a new beer was being brewed in the Burgers’ Brewery in Pilsen. He struck a deal with a friend who worked there to bring him two pails and invited his friends (and a few horse-drawn cab drivers) around to taste it. One thing led to another and soon enough he was leaving the tailor life behind to be full-time landlord of his pub, U Pinkasů. The U Pinkasů quickly became a centre of social and political affairs, and today it counts the beers it pours in the thousands of hectolitres. It’s a legendary establishment in a highly competitive league, and no trip to Prague is complete without spending some time inside it’s walls — and having beer ruined for you, forever.